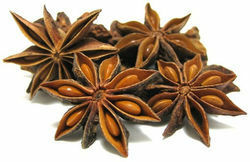 We bring forth for our clients Star Anise Seeds that are an essential ingredient in Chinese five-spice powder. These dried fruits of the illicium verum tree, a type of magnolia native to China and Japan, are acknowledged for their taste and aroma. The range is appreciated for its quality and purity by clients across the globe. Our company has gained name and fame in presenting Organic Aniseed. It is carminative useful n flatulence, spasmodic, affection of inestinal canal and dysentry and can also be used in cough mixture. Broken: 8 % max . Size seeds with diameter 2.5 cm and over: 80% min. Star Anise is prescribed as a digestive aid and to help cure colic in babies. Star anise has been used in a tea as a remedy for rheumatism, and the seeds are sometimes chewed after meals to aid digestion. Our company is dealing with premium quality Anise Seeds that are used for providing a variety of flavours to dishes. Our Anise Seeds are specially procured for healing several medical ailments mainly related to digestive system and toothache. These seeds have tremendous curable capacity and are used to manufacture medical herb. Owing to our vast industrial experience in this domain, we are involved in providing Anise Seeds to our reputed customers. 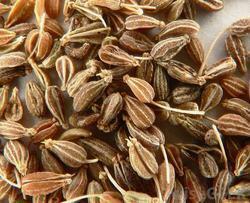 These Anise Seeds can be used to treat pectoral infections, coughs and spasmodic asthma. Besides, these products are available with us in different quantities and packaging at low prices.